A new pizzeria from the people behind Épernay, Atlas and Pour House is launching in Leeds. Launching on Thursday in the heart of the city’s business district, Buca Di Pizza Restaurant and Cocktail Bar will serve up an innovative twist on authentic Neapolitan pizzas. The idea for Buca Di Pizza was born from the owner, Geoff Thornton’s, deep passion for Italian food and culture, having first visited the country as a young child. Executive chef, Adam Geddes, has adopted traditional Italian recipes and methods and is working withartisan Italian suppliers to create an authentic Neapolitan pizza that can’t be found anywhere else in Leeds. 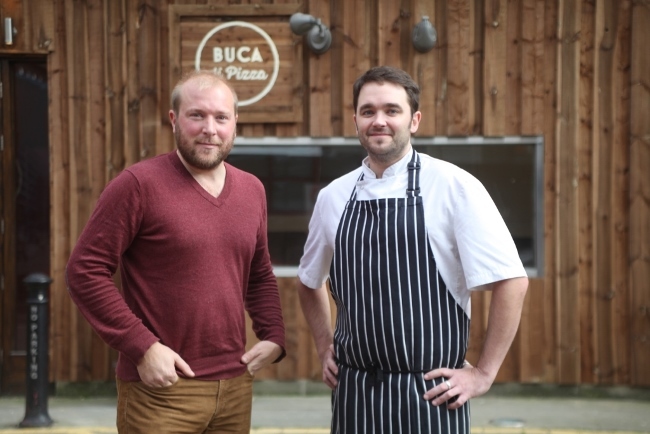 The company behind Buca Di Pizza is the family run Atlas Group, which opened their first restaurant, The Terrace, in Leicester in 2002 and have seven sites in total around the They opened their first bar in Leeds, Épernay in 2005, followed by The Pour House in 2011 and Atlas in 2013. Buca Di Pizza also offers something for the more adventurous diners, with a separate range of modern and inventive pizzas. These include: The Wing Commander with a topping of chicken wings and hot sauce; Bubba topped with fried shrimp and gorgonzola; and also the Aragasta which is topped with a full fresh cooked lobster and is priced at £39. The Italian influence continues to Buca Di Pizza’s bar, which serves a selection of Italian craft beers, prosecco served on draught, a 100-strong menu of Italian wines and a hand picked selection of Italian spirits, liqueurs and vermouths. The cocktail menu includes innovative takes on classic Italian drinks, such as: the Campari Cinque which is a punch based on the most famous of Italian bitters; and Cocchi Rosa & Tonic, a fuity yet bitter vermouth style cooler. The pizzeria has 120 covers across the restaurant and bar area. Takeaway pizzas are also available. Operations manager for Atlas Group, Bruce Lerman, said: “The lobster pizza is a great talking point, but it is through our commitment to authentic Italian cooking techniques where Buca really shines! “We have a real passion for all things Italian and make our pizzas using ancient Neapolitan traditions using the best possible ingredients through our Italian suppliers. All of our pizzas and produce are homemade – even down to the syrup for our Bellini’s!